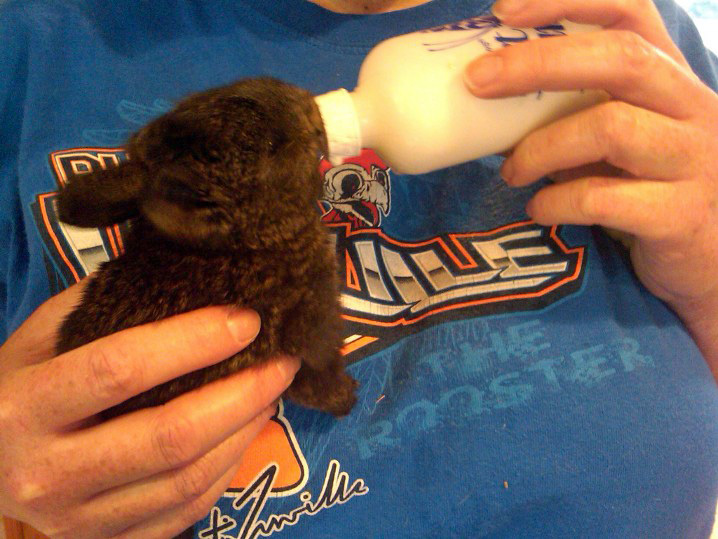 The baby bunnies are growing cuter each day, and exponentially hungrier. I pretty much have the bottle feeding down to a routine, though. First each one gets a bath, and then a snack. Six of the eight eat with no problem – they attack the bottle like one of those face hugging creatures from Alien the minute you wave it anywhere near them. The other two are a little more challenging, but they’ll get the idea eventually. They have a ton of energy now, so we must be doing something right. They are much more interactive at feeding time and hop around in happy little circles when I reach in to grab one. They also want to explore their surroundings, to the extent that Gene had to add a removable baby gate to the front of the nesting box. Apparently hungry bunnies are impatient bunnies, and they keep trying to hop out. We are going to have to update their sleeping quarters soon; they used to just take up a corner of the box, now they sprawl over half of it when they do their pig-pile napping. they jump straight at the camera. 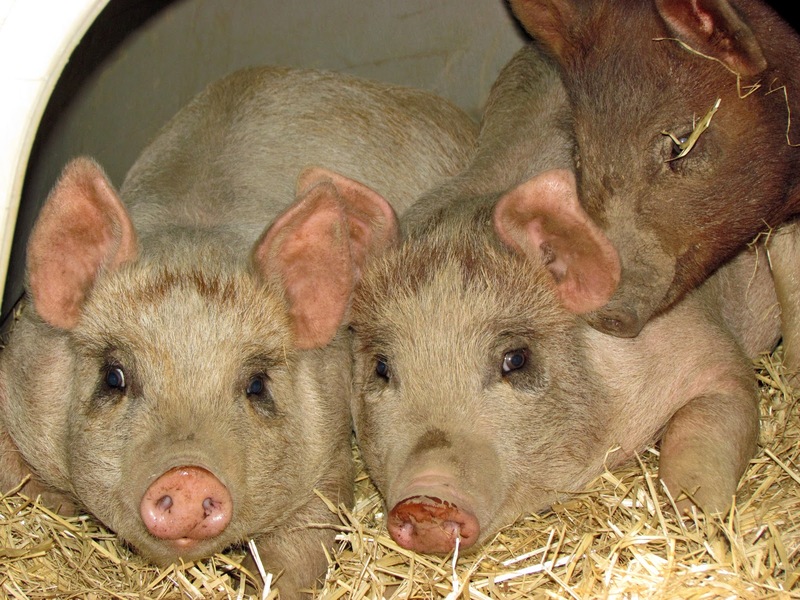 Speaking of pigs, Satan has adapted quite well to the Swine Estate, especially now that we got him some company. We learned that a lone pig is a sad pig, and lord knows I don’t want 300 pounds of despondent, lonely pig on my hands. No, I’d much rather have 900 pounds of content piggies. Gene and Abigail came home with two more, from the same farm up the street. They are bright pink (think Wilbur-style), and named Princess and Charlotte. Satan is much happier, but I’m not any less afraid of them. They have the frightening habit of grunting at me when I go in to feed and water them, and the grunts sound suspiciously like they’re saying, “You”. (I mentally add the “going to get” part). The two pink pigs are foster pigs, since Abigail and another friend decided they wanted one butchered as well. Somehow I’m thinking they’re getting the long end of that particular stick, since they don’t get grunted at on a daily basis. The ducks don’t seem to mind living next door to the Swine Estate, probably because they generate just as much if not more stank. The five new ones have totally integrated with the four rescue ducks, and they are a full-fledged flock now. 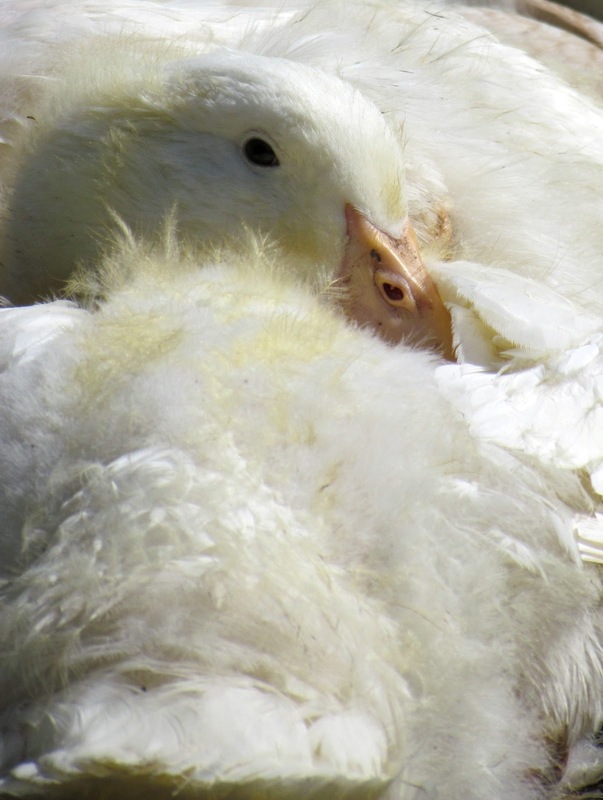 I can’t believe how fast ducklings grow – you can’t even call them ducklings anymore, since they have their proper feathers. Gene built a feeding trough that’s nine butts wide, so now feeding time passes without anyone getting trampled. Always a good thing. 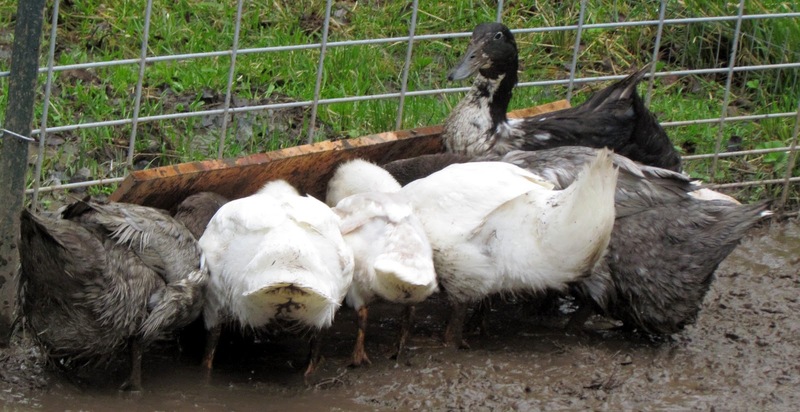 The Pekin ducks seem to be resistant to mud; their feathers are so brilliantly white they glow in the sunshine. Eventually their beaks and feet are supposed to turn bright orange, so they’re going to be really cool looking. Gene is also going to expand their pasture so that they have a place to get out of the mud, although since their home used to have grass, I’m assuming we’ll have the same mud bog, only larger. I think I’ll get Gene to build a basking deck out of scrap cedar so they can hop up and sunbathe should the mood take them. I’m sure he’ll get right on that. I did add a new swim deck to the pond, which I’m quite proud of since I did it all by myself. It’s basically plastic netting between an open square of wood that floats in the water. I couldn’t use the drill so I stapled the netting to the wood, then added a bunch of rocks so it floats about five inches under the surface of the water. The ducks can stand in it and only their legs are submerged, with their bodies completely out of the water. It’s like one of those sun-tanning swimming pools at the high end resorts. They keep bugging me for a pool boy, but I have to draw the line somewhere.